In the mid-1400s, many celebrated artists, goldsmiths, silversmiths and engravers were attracted by the abundance of wealth in the city of Florence, but the most important factor in this gathering of talent was the presence of the Medici family. For almost three hundred years, generation after generation of Medici dominated city affairs and steered the course of art history. It was the Medici family who funded the workshops of these artists and artisans, who commissioned and collected the masterpieces of art and antiquity. From founding father to the last Grand Duke, the immense power and wealth of this great dynasty was invested in its legendary collections, of which the collection renowned as the Gems of the Medici is perhaps the finest in the world. 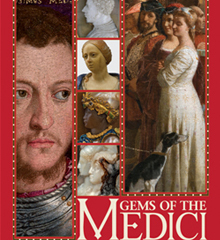 Gems of the Medici, a world-premiere exhibition, highlights some of the oldest and most unique pieces of the Medici collections including antiquities dating from the 1st Century BCE as well as a cornelian which was part of the Seal of Nero. Organized by Contemporanea Progetti, Florence, Italy in collaboration with Museo degli Argenti, Palazzo Pitti and the Museo Archeologico Nazionale Firenze. Support provided by The Wortham Foundation, Inc.